Stable fiberglass sailing boat carries six people (or 1170 pounds). 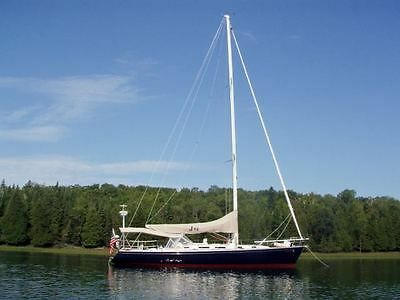 Includes trailer, full rigging, and TWO suits of sails. One suit of sails is in like new condition, the other set is in very good condition. Serial number 1929 (built in late sixties to early seventies I believe). The centerboard swings up into the cockpit, so you can change the depth to dock in shallow water. The rudder also swivels up if it hits an obstruction. The trolling motor in the photos is not included. There is, however a permanent motor mount on the stern. The boat will take up to a 5hp motor, but my 30lb. thrust trolling motor drives it around just fine. The boat is located on West Otter Lake, Angola, IN. Buyer with the selling price in cash or Pay Pal payment can drive it away. (Trailer takes an 1 7/8" ball hitch.) The following article from Sailing Magazine gives a great description of Rebel sailboats. You can access the original on SailingMagazine.net. Rebel 16 2008 January 8 By Staff This nimble and tough classic is perfect for a daysail or a day of racing This year the boat that holds claim to being America's first production fiberglass one-design will celebrate its 60th birthday. That the boat is still in production makes this milestone that much more remarkable. In 1948, fresh out of the Navy, Ray Greene began building a 16-foot family daysailer out of his Toledo, Ohio, shop using a revolutionary new material called fiberglass. The design of the boat was based on lines drawn by a local high school drawing instructor by the name of Alvin Younquist. With its wide, 6-foot, 7-inch beam and 110-pound steel centerboard the stable little boat known as the Rebel soon became a hit on the Midwest's inland lakes. And while Greene said he never intended to create a racer, thanks to the boat's performance-courtesy of a large 120-square-foot main and 46-square-foot jib on a fractional rig-it wasn't long before a competitive structure was built around the boat. By 1952 a class association had been firmly established and by 1963 the class boasted 138 active members. Not bad. Fleets started popping up across the Midwest, south into Kentucky and all the way down to Texas. Meanwhile, class members could be found sailing the inland lakes of the Eastern Seaboard from New York to Florida. After 25 years of building the Rebel, with more than 3,000 hulls produced, Greene was ready to call it quits and sold the works to a group of Chicago investors. Production of the Rebel continued at a steady pace during the 1970s, and was done under a number of names: Melling Tool Co., Rebel Industries and finally Spindrift One Designs. 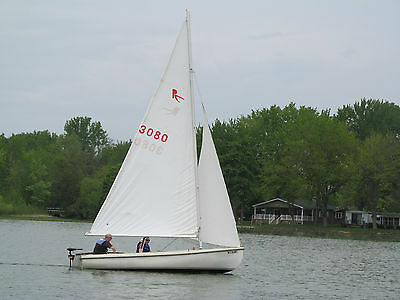 After Spindrift folded, the Rebel moved to Michigan in 1988 when Nickels Boat Works of Fenton took over with the production of the Mark V model. Nickels continues to build the Rebel, offering buyers a choice of a daysailer version for $9,860 or the optimum racing version for $11,872 less sails and trailer. A stainless steel centerboard now comes standard with the Rebel. Nickels also continues to be a great source for parts and accessories, as well as information, on the Rebel. One tough Rebel While there have been reports of problems with the foam flotation on older boats becoming waterlogged, that has been less of a problem on boats from the 1970s and later. 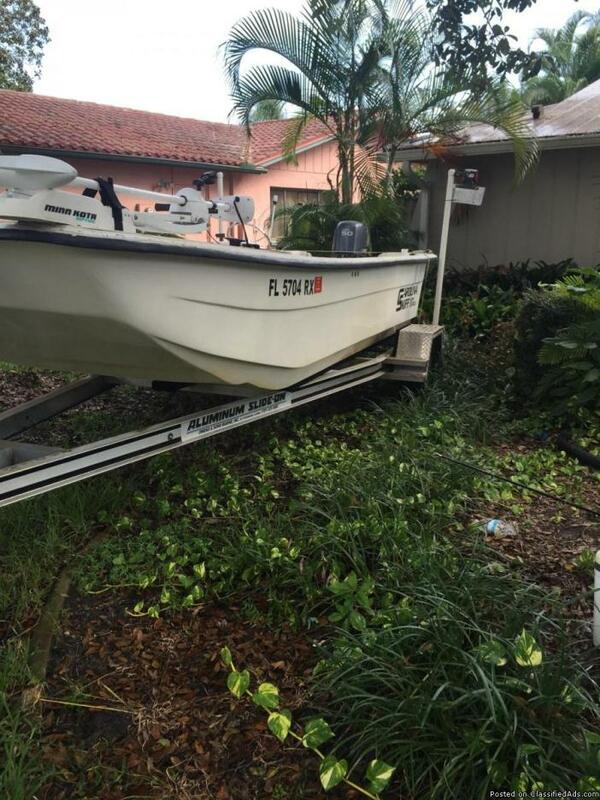 Other than that, a buyer of a used Rebel should find few issues with the condition of this durable little boat. Indeed, boats 25 years and older will still top regatta leaderboards. "They're well made, very rugged boats that will last forever," said Al Vorel, National Rebel Association Commodore, who has been racing the same boat, No. 3914, for almost 20 years. "You don't have to run out every 5 to 10 years to buy a new boat." This is one of the reasons for the longevity of the class. Boats tend to stay in the family, passed down from parent to child, with the younger generations wanting to keep the racing going. "My mother races, and my daughter sometimes races, so there are times we'll have three generations on the course," Vorel said. This also, of course, keeps a lot of boats off the market, and finding a used Rebel can be a bit of a challenge. But thanks to the Internet, it's possible to locate a few sellers. Prices can vary from just under $1,000 for an older boat in need of some work to $3,000 or more for a later model. Buyers can typically expect to pay in the neighborhood of $1,500 for a pre-Nickels-era boat in good shape. We were fortunate enough to find a late 1970s Rebel listed for sale on www.craigslist.org. Better yet, the seller was within trailering distance. The offer on the boat was $1,400, so we drove out to take a look. The boat was well cared for, kept under a roof winters, and showed no structural damage. Other than some algae stains and scuff marks the finish looked good, and all the gear was there, including the main and jib, which the owner said he bought new about seven years ago. We did see some possible issues, including a rusty, pitted centerboard and a wooden rudder that looked to have some rotting. So we offered to pay the full $1,400 if the owner threw in the trailer, which he originally wanted an extra $200 for. The deal was closed and we drove off with the Rebel in tow. Rebel with a cause With the boat parked in our yard the first item of business we wanted to take care of was the rusty centerboard. Nickels offers a stainless steel replacement board, and we could picture how sweet the boat would look with a shiny new stainless fin. Unfortunately, these centerboards run close to $1,000; more than two-thirds the cost of the entire boat. So such an extravagant purchase didn't make much sense. Instead we set about rehabilitating the old board. We removed, with a bit of difficulty, the 110-pound board and set in on sawhorses. The first step was to remove the old paint using paint stripper, then power sanding. We then slathered on some Duro Naval Jelly to remove the rust, wiping down everything with paper towels then finishing up with a clean, acetone-soaked rag. Next, we filled in the pits and hollows with West Marine Surfacing Putty, and sanded everything smooth. We made certain the blade was fair by running a straight edge along the board. We also further faired the rounded leading edge of the board to within the class rule limits, which prohibit tapering less than 1/16th of an inch and more than one inch in from the leading edge. We then primed the board with several coats of Interlux Primocon primer, which when dried we wet sanded with 400-grit paper, and finished with a couple coats of Interlux VC-17m Extra bottom paint. With the centerboard done, we then turned to the rudder. An ice pick determined the wood was beginning to rot near the lower trailing edge. We probably could have rehabilitated the rudder as well, but since we had saved some money by not replacing the centerboard we decided to spring for a new rudder. We opted for a fiberglass blade, supplied by Nickels for $375. This cost covered just the blade, as the original aluminum rudder cheeks and hardware were still in good shape. While we were on the phone with Nickels, we decided to order all new running rigging to replace the weathered lines the boat came with. This included lines for the cunningham, boom vang, centerboard system, as well as sheets and halyards for both main and jib. The total for 112 feet of ¼-inch line and 105 feet of 5/16-inch line came to $100. Next we took a closer look at the standing rigging. The spars showed no defects, and with a bit of metal polish and elbow grease the rotating mast, boom and aluminum whisker pole looked good as new. The 1-by-9 stainless steel shrouds and forestay also showed no visible defects. We did, however, find the diamond stays on the mast to be tuned rather tight. According to the North Sail's One-Design tuning guide for the Rebel, an overly tight diamond can limit fore and aft mast bend, and can even cause negative pre-bend, where the mast bends forward at the tip. Since we want to have a competitive boat, we loosened the diamond tension and will readjust after doing some sea trials. As we said, we ultimately wanted to race our Rebel and didn't want a slow boat. So obviously the 7-year-old suit of sails had to go. This would be our biggest expense, and a new suit of sails would alone exceed the original cost of the boat. A new main and standard jib (a light air jib is also available) from North Sails set us back $1,615, which included $20 for class royalties but not shipping. Certainly this was a blow to our budget, but we rationalized it by thinking about the fun we would be having with some close racing come summer. Our last order of business was getting our bottom clean and smooth. We first scrubbed the hull down with a detergent then wet sanded everything below the rails to a slick surface with 1,200-grit paper. After a rinse and wipe down with the hose and clean towels we were satisfied we had a slick bottom. We finished off by treating all our hardware and moving bits to a little McLube Sailkote spray. We now have what we feel will be a contender on the course for our racing crew of two. Yet, with the roomy Rebel cockpit that can seat six, we're also looking forward to some lazy summer daysailing when friends and family show up. Either way, we'll certainly get our money's worth from this tough but nimble little classic. LOA 16' 1.5" LWL 15' 10" Beam 6' 7.5" Draft 3' 4" Weight 700 lbs, Sail area 166 sq. 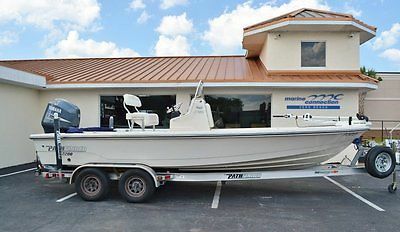 ft.
Marine Connection Boat Sales 1-772-222-7850 Vero Beach, FL 2011 Pathfinder 2200 TRS Bay Boat Bay Boat 2011 Pathfinder 2200 TRS Boat Yamaha 150hp custom trailer Trolling motor $39,900 ConditionUsed MakePathfinder Model2200 TRS Bay Boat Powered byYamaha F150XA Four Stroke Length22'2" Beam8'6" Hours197 (Actual) Get Pre-Approved PHOTOS BOAT HIGHLIGHTS Hydraulic Steering Trolling Motor Garmin 740's Fusion Stereo Bimini Top BOAT INFORMATION The Pathfinder 2200 TRS is the most popular Pathfinder yet. It's a do most anything and go most anywhere crowd pleaser. Catch the early morning bite, take the family for a mid-day ski, and then invite your friends over for a sunset cruise. With a larger deck, integrated aft seating, and several storage compartments, there's room for everyone and all the day's gear. Best of all, because you're in a Pathfinder, you can do it all in unmatched safety, confidence and style. 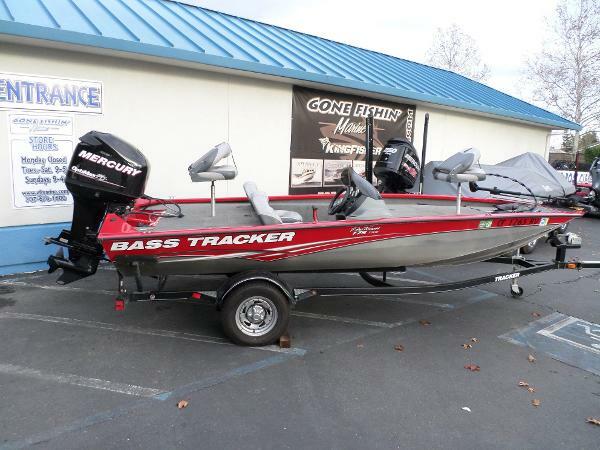 Here we have this 2011 Pathfinder 2200 TRS bay boat. This boat is powered by a 150hp four stroke Yamaha outboard with a stainless steel prop. The outboard only has 197 hours on it and is under warranty until 8/2016. If you are looking for a do everything boat this Pathfinder is it. 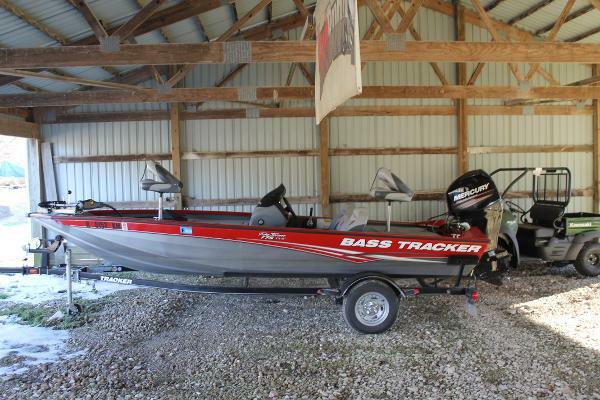 Equipped with hydraulic steering, garmin gps, fusion stereo and minn kota trolling motor. It has a very nice large bimini top and a full boat cover. It comes with the tandem axle aluminum Ameritrail trailer that is shown in the pictures that has all welded bunks and is made for this boat and fit great. The exterior and interior of this boat are in great shape. The boat has just had its annual service. Our service department has performed a mechanical evaluation & water tested it and she performs great - the motor has good/even compression on all cylinders. Surveys and mechanical inspections are welcome. Sold as-is, where-is. HISTORY REPORT Know before you buy with a Boat History Report. These comprehensive reports include: Accident check, Salvage check, Environmental Lien check, Seizure check, Hurricane Damage checkand much more... Click below for your FREE Boat History Report! That's right, we have already paid for it! View Boat History Report FEATURES & OPTIONS Deck Options Hydraulic Steering Rub Rail, Black with SS Insert Leaning Post Backrest w/ Cushion Bimini Stereo (4 Speaker) Removable Cooler w/Cushion Rod Holders, Flush Mount MinnKota 80lb Thrust Garmin 740s SPECIFICATIONS HIN MVIPW043C111 Length 22'2" Beam 8'6" Person Capacity 7 Weight 2,650 lbs. Deadrise 15 Draft 11 Fuel Capacity 56 gal Exterior Top Bimini-Top Exterior Color Pure White Warranty Expires 08/27/16 Engine(s) Yamaha F150XA Four Stroke, 63PX-1103821 TRAILER A 2011 AmeraTrail Tandem Axle Aluminum trailer IS INCLUDED in the price of the boat! FINANCING SHIPPING & DELIVERY United StatesWe offer nationwide delivery to your door! Please contact our Sales Department for an accurate delivery quote. International / Export Australia: We ship to Sydney, Brisbane, Melbourne, Fremantle and all Australian ports. Please our Sales Department for the most accurate shipping rates. Canada: We can deliver to your nearest boarding crossing. Please contact our Sales Department for pricing. Europe: We ship to Bremerhaven, Amsterdam, Gotherburg, Southampton and all European ports. Please contact us for the most accurate shipping rates. We also offer CE Certification! South & Central America: We ship to all major ports, please contact our Sales Department for the most accurate shipping rates. Asia: We ship to all major ports, please contact our Sales Department for the most accurate shipping rates. ABOUT MARINE CONNECTION The Ultimate Boat Shopping Experience. Welcome to Marine Connection - South Florida's #1 Boat Dealer. We are a new boat dealer for Cobia, Hurricane, Pathfinder, Sportsman, Rinker, Bulls Bay and Sweetwater boats along with pre-owned bank repossessions, liquidations, factory distressed short sales, close-outs, trade-ins, and more. We have been selling and exporting boats since 1987 and still hold true to our founding goal of providing the most pleasant and professional boat purchasing experience for thousands of satisfied customers. Marine Connection has been named Boat Dealer of the Year by Boat & Motor Magazine and ranked 6th in Boating Industry Magazine's list of Top 100 Boat Dealers, the most coveted award in marine market. We were also one of the first dealerships in the nation to receive Five Star Marine Industry Dealer Certification. Our NEW Vero Beach store is conveniently located on US Highway 1, just south of 17th Street. This facility is the exclusive new boat dealer for Cobia, Hurricane, Pathfinder, Sportsman, Bulls Bay and Rinker boats on the Treasure Coast! 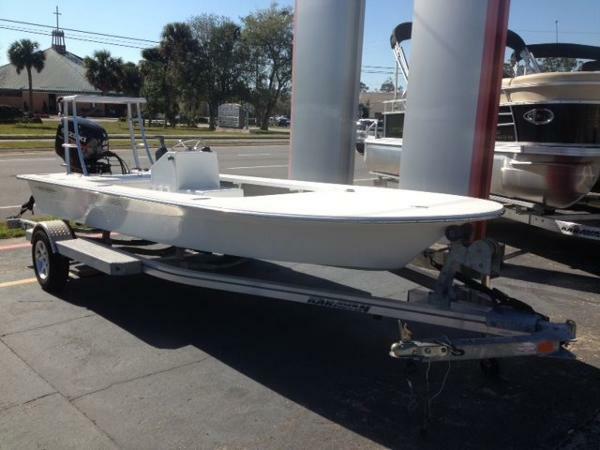 View our other Auctions CONTACT US Located at Marine Connection - Vero Beach 1530 U.S. 1 Vero Beach, FL 32960 Business Hours Monday Closed Tuesday 9:00am - 6:00pm Wednesday 9:00am - 6:00pm Thursday 9:00am - 6:00pm Friday 9:00am - 6:00pm Saturday 9:00am - 6:00pm Sunday 10:00am - 4:00pm Deposit is required within 2 days from end of auction (non refundable) and full payment is required within 7 days. We offer a number of financing options with approved credit. If you are planning to use our financing services, please pre qualify before bidding by calling us at 1-888-693-3470. Boat must be paid in full before delivery. All boats are charged a $240.00 administrative office paperwork fee, for Florida residents we also collect sales tax. Items are listed internationally and we reserve the right to end listings early. Payment methods: Certified Cashier's Check, Wire Transfer, Cash in Person - call for more details. Shipping: Nationwide delivery is available as well as shipping worldwide. 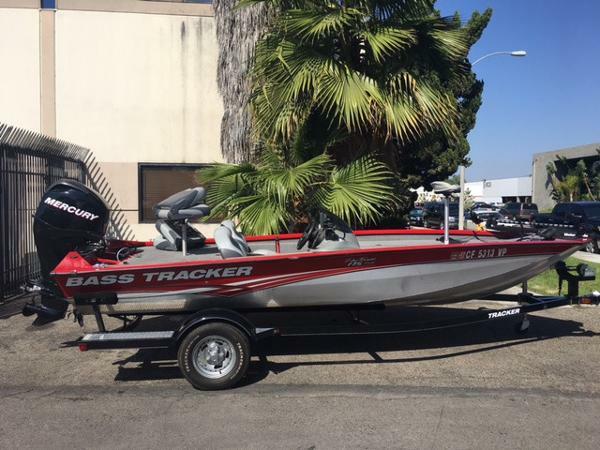 2011 Tracker Pro Team 175 TXW This Boat is in Excellent Condition. 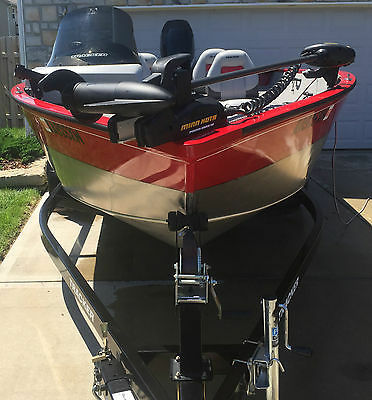 2 lowrance mark 5x pro's Motorguide 12V 46LB Thrust On Board Charger Custom Sunbrella Boat Cover All-welded Revolution hull with Smooth Ride Guarantee All-aluminum Power-Trac set-back transom for a quicker holeshot MotorGuide 12V, 46-lb thrust foot-control trolling motor Lowrance X50 DS fishfinder w/surface temperature Lockable 8' center rod box, rod hold-down straps (bow deck and cockpit side) 2 bow storage boxes (and center rod box) feature welded, drained rain channels for drier storage Aft drop-in molded boxes w/3 tackle trays total Aft 16-gal. livewell w/NEW FOR 2011 bait bucket-aerated, timed and recirculated w/pump-out 2 fishing seats w/pinchless hinges and NEW FOR 2011 secure screw-in pedestals 3-across seating w/storage below, fold-down center seatback w/drink holders and step to aft deck Cranking and trolling batteries by Interstate 2-bank, 4-amps per bank (8 amps total) battery charger Painted gunnel and hull sides w/natural aluminum bottom for long-term durability Custom factory-matched trailer w/NEW FOR 2011 heavy-duty load guides, EZ lube hubs, swing-away tongue w/retractable safety cables and all-welded frame w/GalvaShield protection Talk about a fishing classic! You're looking at it-improved and updated with NEW FEATURES AND VALUE FOR 2011. It's why the 17' 7" (5.36 m) Pro Team 175 TXW is destined to remain the top-selling fishing boat by which all others are judged. We never stop improving it. Check out the NEW FOR 2011 features listed to the right. The Pro Team 175 TXW is the perfect mix of size and performance-and at the top of its class in rock-solid, all-welded aluminum construction. The TRACKER-exclusive Power-Trac transom gives you a better holeshot on takeoff. And the ride is unbeatable, backed up by the Smooth Ride Guarantee. The sleek painted gunnels and hull sides are a standout on the lake. And we source our components from the best brand names in the business. You'll find a MotorGuide trolling motor, Lowrance fishfinder, an onboard battery charger, a 60-horsepower Mercury outboard and a factory-matched trailer-all STANDARD EQUIPMENT! The high-value Pro Team 175 TXW is Number One for lots of reasons. 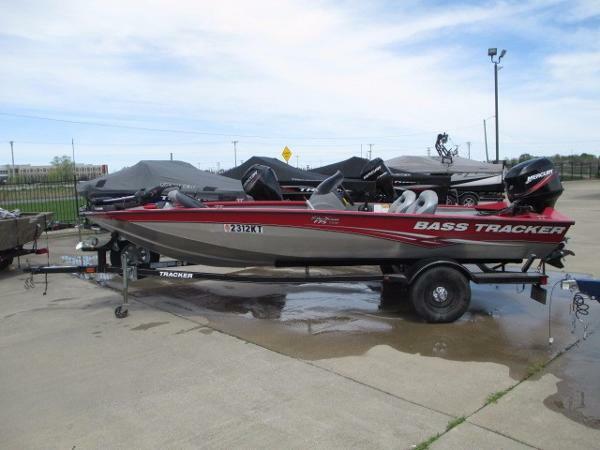 2013 TRACKER BOATS Pro Team 175 TXW 2013 Tracker Boats Pro Team 175 TXW 17'-7" Tracker PT175TXW with a Mercury 60 HP 4 Stroke America's favorite. Still! This is the perennial #1-selling fishing boat for lots of reasons! The Pro Team™ 175 TXW continues to be the aluminum fishing boat anglers and their families choose over all others. And it’s obvious why! This boat provides the best of all worlds!. Great amounts of interior room for maneuvering while fishing. Unbeatable performance abilities, thanks to the Revolution™ Hull with its Smooth Ride Guarantee™. Our NEW Diamond Coat finish with unmatchable styling. And a long list of value-packed features to enhance any and every fishing trip, including a Minn Kota® trolling motor with a recessed foot pedal (with tool and drink holders), a NEW console with a phone holder and full instrumentation, TWO aerated livewells, two fishing chairs and plenty of storage for all your gear, including a designated center rod locker for rods up to 8’ (2.44 m) long!Features May Include:NEW Diamond Coat™ finish w/industry-exclusive powder coat & clearcoatNEW rotomolded console w/Lowrance® fishfinder & increased legroomNEW 19-gal. (71.92 L) aerated bow livewellNEW dry storage containersTRACKER-exclusive all-welded Revolution™ hull w/Smooth Ride Guarantee™ & Power-Trac™ set-back transomMinn Kota® 12V, 45-lb. thrust, foot-control trolling motor w/NEW foot pedal recessLockable 8' center rod box & deck-mounted rod hold-down strapAft 16-gal. 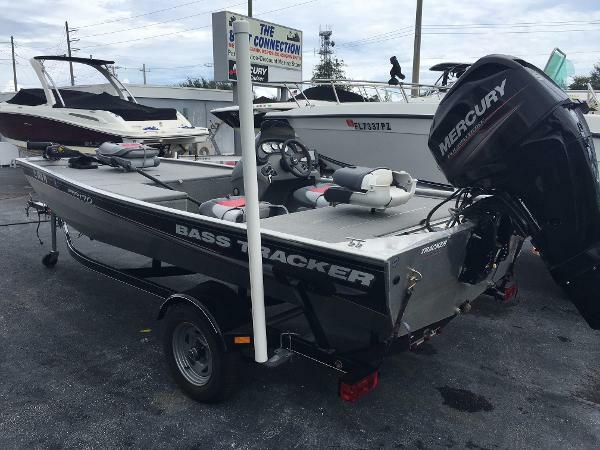 livewell w/aerator, timer & recirculator w/pump-outNEW 3-across seating w/port & starboard storage & fold-down center seatback w/step to aft deck2-bank, 4 amps per bank (8 amps total) battery chargerCustom factory-matched trailer w/heavy-duty load guides, EZ lube hubs, swing-away tongue w/retractable safety cables & all-welded frame w/GALVASHIELD® protectionONLY 30 HOURS OF RUN TIME!!!! 2 bank onboard charger, MinnKota 55LB thrust 12V trolling motor, Garmin Echomap 53DV Color GPS depth finder, SAVE THOUSANDS over a new boat. 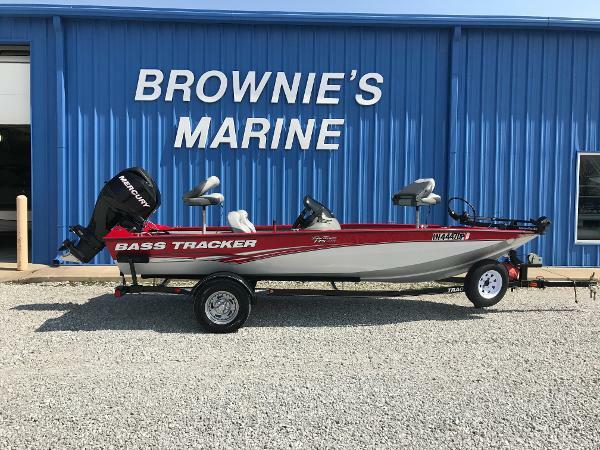 2011 Tracker Pro Team 175 TXW This boat is on consignment.. no sales tax SHOW ROOM CLEAN... Has a pile of upgrades All-welded Revolution hull with Smooth Ride Guarantee All-aluminum Power-Trac set-back transom for a quicker holeshot MotorGuide 12V, 46-lb thrust foot-control trolling motor Lowrance X50 DS fishfinder w/surface temperature Lockable 8' center rod box, rod hold-down straps (bow deck and cockpit side) 2 bow storage boxes (and center rod box) feature welded, drained rain channels for drier storage Aft drop-in molded boxes w/3 tackle trays total Aft 16-gal. livewell w/NEW FOR 2011 bait bucket-aerated, timed and recirculated w/pump-out 2 fishing seats w/pinchless hinges and NEW FOR 2011 secure screw-in pedestals 3-across seating w/storage below, fold-down center seatback w/drink holders and step to aft deck Cranking and trolling batteries by Interstate 2-bank, 4-amps per bank (8 amps total) battery charger Painted gunnel and hull sides w/natural aluminum bottom for long-term durability Custom factory-matched trailer w/NEW FOR 2011 heavy-duty load guides, EZ lube hubs, swing-away tongue w/retractable safety cables and all-welded frame w/GalvaShield protection Talk about a fishing classic! You're looking at it-improved and updated with NEW FEATURES AND VALUE FOR 2011. It's why the 17' 7" (5.36 m) Pro Team 175 TXW is destined to remain the top-selling fishing boat by which all others are judged. We never stop improving it. Check out the NEW FOR 2011 features listed to the right. The Pro Team 175 TXW is the perfect mix of size and performance-and at the top of its class in rock-solid, all-welded aluminum construction. 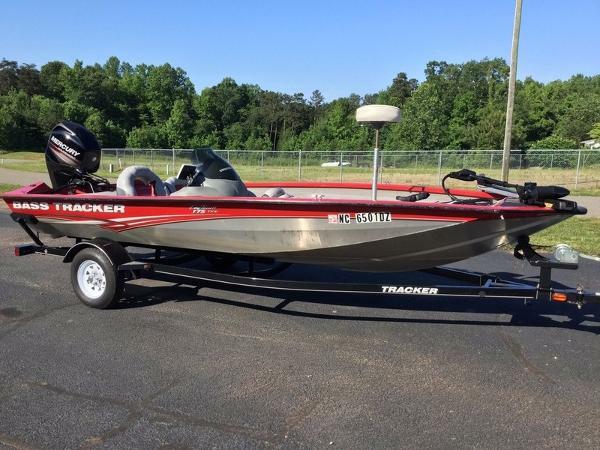 The TRACKER-exclusive Power-Trac transom gives you a better holeshot on takeoff. And the ride is unbeatable, backed up by the Smooth Ride Guarantee. The sleek painted gunnels and hull sides are a standout on the lake. And we source our components from the best brand names in the business. You'll find a MotorGuide trolling motor, Lowrance fishfinder, an onboard battery charger, a 60-horsepower Mercury outboard and a factory-matched trailer-all STANDARD EQUIPMENT! The high-value Pro Team 175 TXW is Number One for lots of reasons.